A big church in a large, curiously remote village. Metfield, with its pub and community village stop staffed by volunteers, is far enough from anywhere of any size to feel like it has a life of its own, and in the 19th Century this was even more the case. 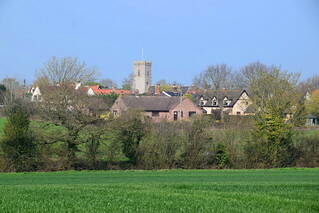 At the time of the 1841 census, when the populations of most rural East Anglian parishes were beginning to reach their peak, this village had more than 700 residents, and could boast a surgeon, a schoolmaster, a tailor, a bricklayer, an inn and two beerhouses, three shoemakers, two butchers and three grocers. White's <i>1844 Directory of Suffolk</i> notes that Mrs Susan Godbold has resided in the parish for eighty years, and in 1843 she walked round the village on her 104th birthday. A century later, Arthur Mee found her grave while poking around in the churchyard, and noted that she had died at the remarkable age of 105. However, the church seems to have been in a fairly moribund state by the early years of the 19th century. By one of those arcane pieces of Church legislation, the church was what was known as a donative, which is to say that there were no presentation to the living or rectorial income, and the institution of a minister was in the hands of the congregation, who paid him a salary as a chaplain. This was all well and good, and sounds very democratic, but it relied on a large number of parishioners attending church and paying for the privilege of doing so. 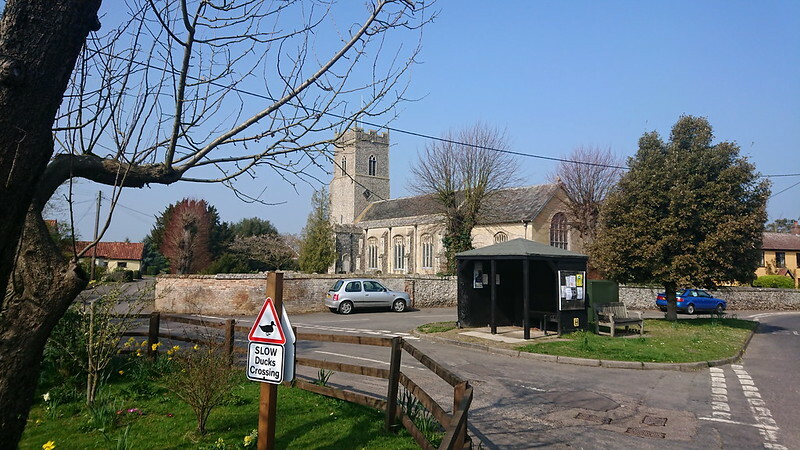 By the 19th century, the level of Anglican churchgoing in East Anglia had fallen to about a tenth of the population (it was slightly higher than this in Metfield) and consequently there simply wasn't enough money to maintain a minister and the upkeep of the buildings. 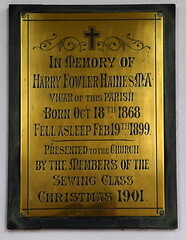 Thomas Mayhew, the Rector of Rumburgh St Michael, who served as chaplain at the time of the 1851 Census of Religious Worship, complained that some parishioners who have not signed the agreement have refused to pay their portion of composition which cannot be recovered without action at law... in the course of time this church will be robbed of its only money payment. 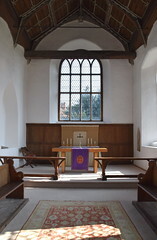 In some parts of Suffolk, the independent churches were more popular than the Established church, but this seems not to have been the case at Metfield, where the Methodist Society had only about a dozen members. 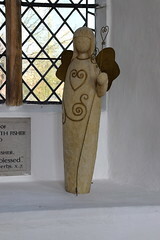 It seems that in Metfield, as in most of north-east Suffolk, most people simply didn't go to church any more. 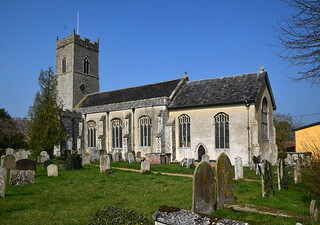 A series of reform acts, and the revival of the Church of England in the second half of the 19th century, would have a dramatic effect on parishes like Metfield. And yet, the restoration of the church was a light one. The large, aisleless church sits in its tight graveyard, 18th and 19th century gravestones huddling against it. The view from the west is typical, with no great statements, no flowery Victorian windows, just a fine, tall tower lifting to a simple bell window and the battlements and pinnacles restored in the 18th century. Apart from these, the building is pretty much as it was on the eve of the Reformation. 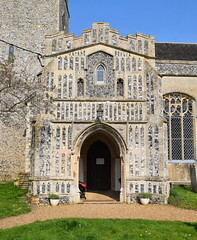 The 15th century porch is typical of the way in which rural East Anglian parishes tried to emulate the grandeur of near-neighbours with more money. 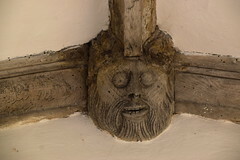 Here, the porch is vaulted, but in wood, probably by a local carpenter, and there are even bosses as if we were in the porch of Eye or Wymondham. 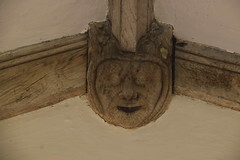 These are also wooden, several depicting heads. 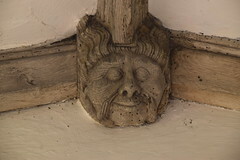 One is a green man, another had swallow nests tucked in above to give him a full head of hair on one occasion that I visited. The central boss is bigger than the rest. 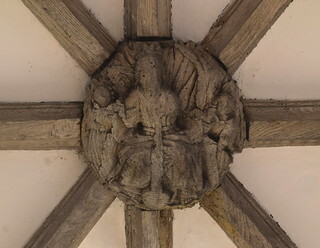 It's a bit battered, and is said to depict Christ in Majesty, although it appears to me that he is holding the remains of a cross, in which case he is probably a rare wooden depiction of the Holy Trinity, God the Father holding the crucified Son as the dove of the Holy Spirit descends, these last two members of the Trinity now lost. 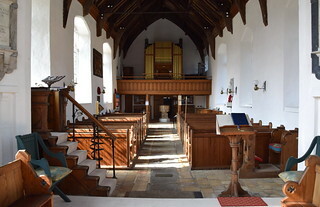 You step into a nave which is light and open, the furnishings attractive. 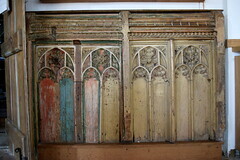 There's a pretty west gallery put up in the 18th century, and below it are surviving panels from the medieval rood screen, still with their original paint. 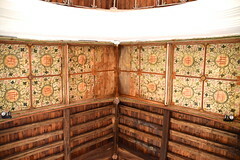 When Peter Dickinson was revising the Little Guide in the 1950s he found these still in situ within the chancel arch, but the chancel has since been simply reordered, as full of light as the nave. 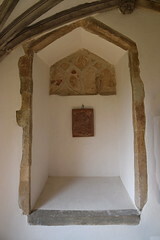 The great treasure of Metfield church is set in the roof above the east end of the nave. 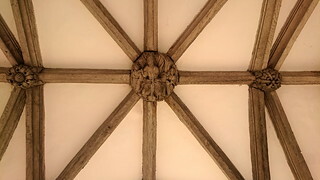 This is the 15th Century canopy of honour, a decorative boarded ceilure. 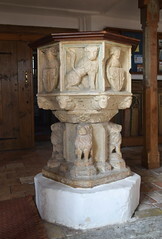 It was designed to surmount the rood, the crucified Christ flanked by the Blessed Virgin and St John, but this would have been destroyed by the Anglican reformers in the middle of the 16th century. 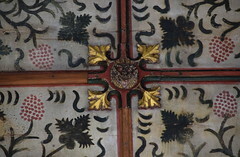 On the large bossed panels are roundels containing the monograms IHC and AMR surrounded by flowers and foliage, rendered in red and green. If you look carefully at the south side you'll see that one of the middle bosses has a grinning face with its tongue out. It was probably intended as an animal of some kind, but it has become known as the Metfield imp. Anyone who has visited this church will recall the slow, steady ticking of the early 17th century clock. You can see the mechanism through the gates in the tower arch. It was already more than two hundred years old when Sarah Godbold did her birthday walk around the streets of Metfield.